Offshore wind could become Britain’s cheapest source of renewable power within a decade as planning constraints prevent the deployment of larger, more cost-efficient turbines onshore, new research has found. 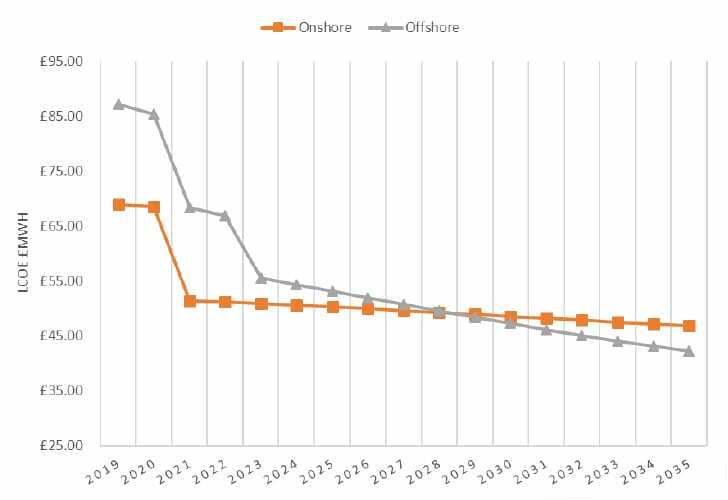 Based on current trends, Cornwall Insights has forecast the levelised cost of energy (LCOE) for offshore wind to fall below that of onshore wind in 2028. “The renewable energy market is under a process of transition with onshore wind facing the real prospect of being usurped by its offshore cousin to be the cheapest source of clean power in the not so distance future,” said Tom Edwards, senior modeller at the consultancy. “Improvements in offshore technology are occurring all the time and for offshore wind increasing the size of turbines is making a significant impact, with 8MW models currently being deployed and larger 10MW and 12MW models under development as the technology advances. Edwards said unless informal restrictions on turbine height are removed, onshore windfarms will be unable to take advantage of these improvements: “For onshore wind to keep pace with its offshore counterpart, planning decisions will need to be relaxed. “This will not only to benefit consumers with cheaper cleaner energy but help the government towards its decarbonisation targets”. Last week, Siemens Gamesa launched a new 10MW wind turbine with a rotor diameter of 193 metres. The first prototype is due to be installed later this year, with the first commercial deliveries expected in 2022. MHI Vestas also unveiled a 10MW turbine in September, whilst GE Renewable Energy is developing an even more powerful 12MW turbine that is set to be trialled at the Offshore Renewable Energy Catapult’s power train test centre in Blyth.